Guests at Friends & Company in Madison will dine with Abundance! a collection of new paper cuttings by Branford artist Martha Link Walsh, on display at the restaurant from January 15 - February 25. An Opening Reception is scheduled for January 20, 2:30 - 4:00pm. The dictionary describes abundance as a relative degree of plentifulness, an overflowing of riches. It’s an apt title for Walsh’s collection of new works which burst from their frames with an exuberance of color and a depth of meaning. 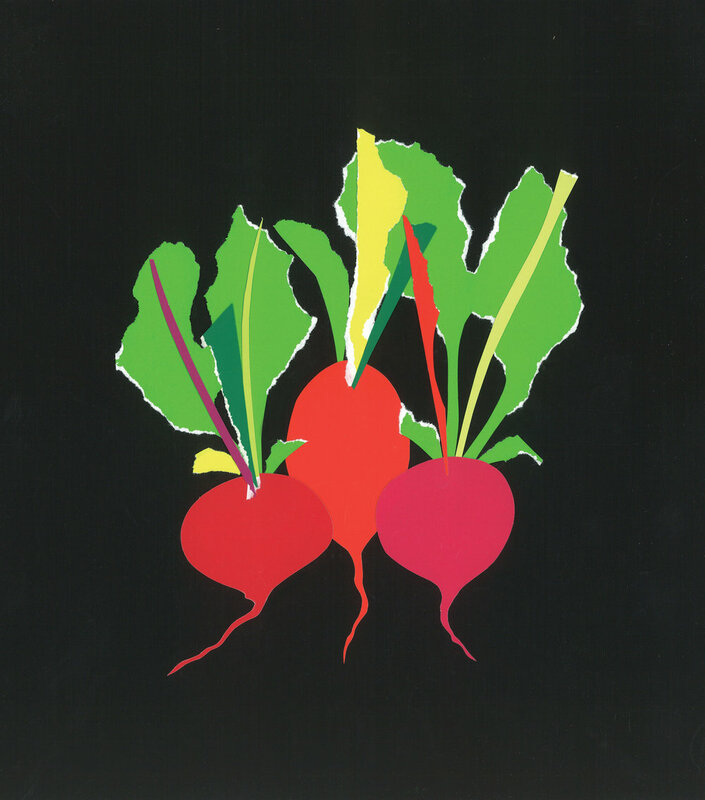 The Friends & Company show will feature a series of vegetable cut paper collages, as well as many of the pieces shown at Stony Creek's Willoughby Wallace Library in November 2018. Friends & Company, a shoreline staple since 1980, regularly displays artwork by local artists. They are located at 11 Boston Post Road in Madison. For more information, visit www.friendsandcompanyrestaurant.com or contact Martha Link Walsh, (203) 481-3505. Do you ever wonder why we hang stockings at Christmas? Where tinsel comes from or why we remember the little drummer boy? Find out in Stories of Christmas, the new Paper-Cut Christmas book from Branford artist Martha Link Walsh. 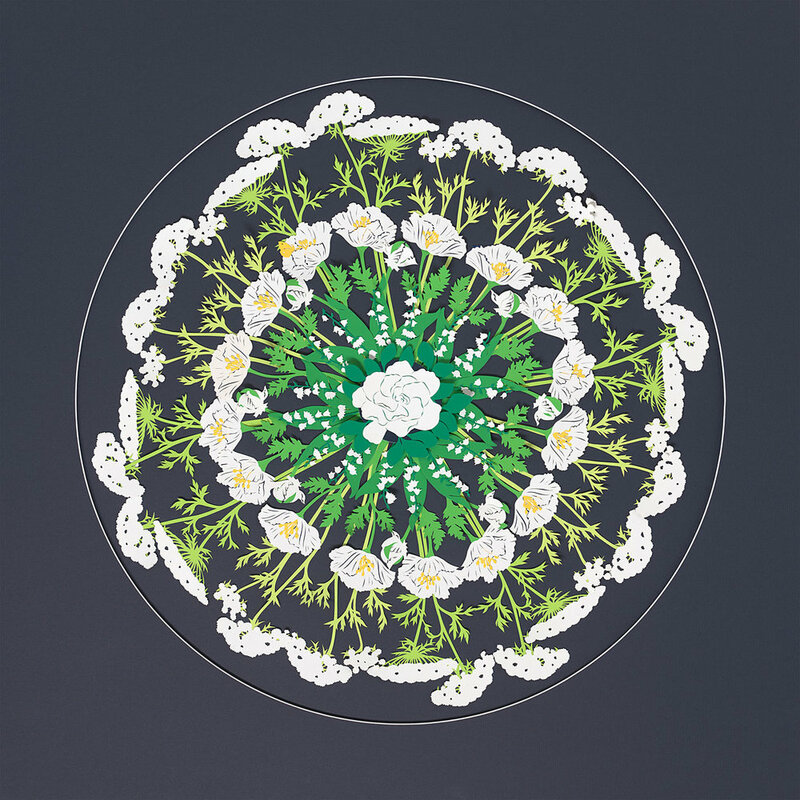 For more than 45 years, Walsh has perfected her skills in the ancient techniques of cut-paper art. For this third book in the Paper-Cut Christmas series, she gathered inspiration from her love of storytelling and the miracles of the season told to her as a child. Discover the Stories of Christmas that pass on traditions, recreate our myths, and remind us of Christmases shared with family and loved ones. Like a circle of time, the illustrations for these 25 stories add detail and charm to childhood memories, our make believe and want-to-believe tales. Book launch, reception, and kick-off for the 2018 Shoreline Arts Trail weekend. Book launch, reception, and kick-off for the Holiday Open House featuring Cynthia’s Flower Shop, Lucky Re-Do, and guest artists Susan Roberts, Anita Griffith and Bob Parrot. Both events are free and open to the public. Refreshments will be served. The Martha Link Walsh Gallery is located at 188 North Main Street in Branford. For more information, contact: Martha Link Walsh, marthalinkwalsh.com, (203) 481-3505. Visitors to the Willoughby Wallace Memorial Library gallery are encouraged to find Abundance! a collection of new paper cuttings by Branford artist Martha Link Walsh, on display from Friday, October 26 - Tuesday, November 20. Walsh and fine art photographer Gaile Ramey will host an Opening Reception on Sunday, November 4, 4-6pm as part of this joint exhibit sponsored by the Friends of the Willoughby Wallace Memorial Library. Martha will also give an Artist’s Talk on Thursday, November 15 at 7pm to talk about her inspiration and process for the two dozen images on display. Join local artists Cynthia Purcell, Owen Sea Luckey and Martha Link Walsh for a special Mother's Day Open House to honor the moms in your life! Stop by the shops at 188 North Main Street (Branford) on Saturday, May 12 from 9:00am to 5:00pm to be inspired. As a show of support for shoreline moms, a percentage of the day's proceeds will be donated to the Women & Family Life Center in Guilford. Imagine stopping at one location to find a keepsake work of art, seasonal custom bouquets and plants, or a unique outfit just in time for Mother's Day. Light refreshments will be served. The event takes place at 188 North Main Street in Branford. For more information, contact: Martha Link Walsh, (203) 481-3505. Martha's cut paper ornaments will surely be a special addition to your tree, to add to your home decor, or to give as a gift. The stories in this book are about real and imaginary heroes who inhabit chilly landscapes and bring gifts of cheer and hope during long winter nights. Legends created and handed down through generations of storytelling … Holland’s Saint Nicholas, Italy’s Lady Befana, Poland’s Starman and Sweden’s Santa Lucia are among the magical characters described in this book. Read one story a day during your month leading up to the 25th of December. Holiday traditions may vary among cultures and generations, but the carol The Twelve Days of Christmas has lasted the test of time through both. 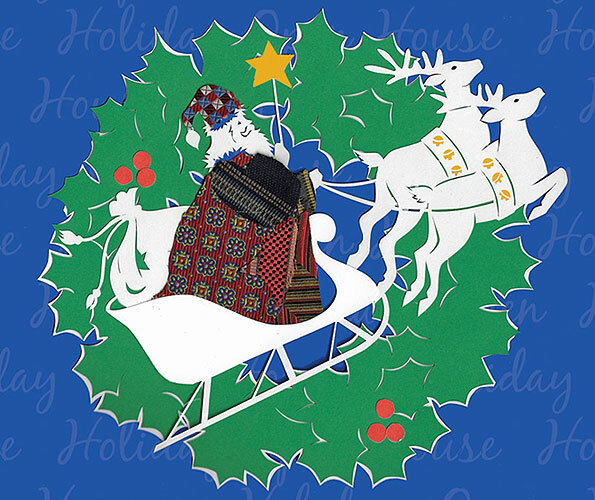 Unwritten origins and references to mythology and pagan beliefs, plus their intriguing meanings given by Christians, add to the enduring magic of the Christmas classic, highlighted by Martha’s unique papercut interpretations. The joy of the song is echoed in this holiday book. Flights of Fancy focuses on a colorful and whimsical bird for each month, done in a stylized design. The price includes a lucite frame to showcase one month at a time. Unique ornaments for your tree, to tie onto your packages, hang from your mantle or to give as a special gift. These paper-cut designs are hanging freely inside each blown glass ornament, like a ship-in-a-bottle. Pure magic for the season. Add a tea light or candle to your wine glass, cover it with these handmade papercut shades and transform any table setting, mantle decoration or special nook with an enhancing soft glow. Decorated with colorful papercut designs, these glass “trays” will brighten up your kitchen, dining area or party table. A baker’s dozen of bird notecards. One of each month’s calendar design printed as 5X7 notecards and packaged together. Perfect for your thank you notes or remembrances. It's easy to get into the holiday spirit at 188 North Main Street1 Not only will you find three magical shops in one location, but you'll also be supporting Feed Branford Kids, a local non-profit helping to feed kids from families in need. This is the 25th Annual Holiday Open House, now hosted by Cynthia’s Flower Shop, the Martha Link Walsh Gallery, and Luckey Redo. The event takes places on Saturday, December 2 and Sunday, December 3, from 10am to 4pm. On Saturday at 1pm, Cynthia's Flower Shop is hosting a Hanging Succulent Terrarium Workshop. Attendees will plant succulents inside a glass terrarium and select a holiday ribbon for hanging. The cost for the workshop is $15; please call to register, (203) 481-3115. Just in time for the holidays! Be sure to stop by the Martha Link Walsh Gallery during the Shoreline ArtsTrail OPEN STUDIOS WEEKEND to find all sorts of creative gift ideas including the 2018 Flights of Fancy calendar! See you this weekend! Have you seen Evidence of Flossing? Join the Martha Link Walsh Gallery as we kick-off the launch of Evidence of Flossing: What We Leave Behind, a new book by Branford author Jen Payne. The Martha Link Walsh Gallery is located at 188 North Main Street, Route 1 in Branford. The shop is open Tuesday-Saturday, 9AM - 5PM. For more information, contact: Martha Link Walsh, marthalinkwalsh.com, (203) 481-3505. 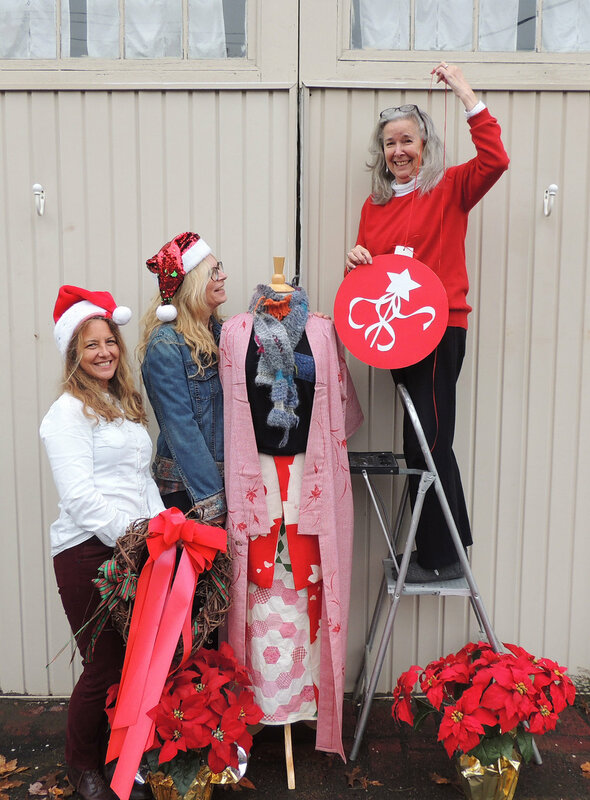 Branford Artists Create Christmas in July! It was serendipitous that three artists ended up sharing space at 188 North Main Street in Branford. One by one, they found their way to this funky space along Route 1 and set down to making art. Now, they've put together a little Christmas in July just for you! Join Martha Link Walsh, Cynthia Purcell and Owen Luckey for this special event, Saturday, July 15 and Sunday, July 16, from 10am - 4pm both days. At the Martha Link Walsh Gallery, see Spread Your Wings to Soar, an exhibit of Walsh's newest paper cuttings. At Luckey ReDo, you'll get to see the latest creations by this popular textile artist including a new line of re-imagined denim jeans. Well-known for her creative floral displays, Purcell welcomes visitors to stop into the flower shop to enjoy some of her recent arrangements. There will be plenty of items for sale, including potted plants and seasonal flowers at Cynthia's Flower Shop; wearables and accessories at Luckey ReDo; cards, prints and papercut luminaries at the Martha Link Walsh Gallery, plus a chance to purchase the new 2018 Papercut Calendar! For me, the swan has always personified my Mom. She was incredibly beautiful inside and out. Fiercely protective but nurturing of her family she moved through her life with grace and fluidity. What represents your Mom? Your wife? Someone you love? Let us work together to create the perfect gift for the woman in your life, a special gift for Mother’s Day and more! Give me a call or stop by the Gallery today! Martha Link Walsh will introduce her new book, A Paper-Cut Christmas: Legends of the Gift Giver, at her gallery on Thursday, December 5 from 6:30 – 8:30 p.m.This special evening will kick off her book-signing events and the holiday distribution of this magical book. A self-taught artist, Walsh has maintained a gallery in Branford for 40 years, selling her original creations and one-of-a-kind paper-cut family heirlooms. Each is designed to tell a story – a birth, a wedding, a retirement, a celebration – in paper-cut images and symbols that capture memories for years to come. As a special gift is included for those who purchase A Paper-Cut Christmas: Legends of the Gift Giver at the Martha Link Walsh Gallery, 188 North Main Street in Branford. Copies may also be purchased online atwww.marthalinkwalsh.com. For more information, contact Martha at (203) 481-3505, or marthalinkwalsh@comcast.net.